A businessman walking through the East Side of Manhattan Monday was startled when a 3-pound helicopter drone crash landed a few feet from him. The man recovered a memory card from the downed craft and passed it along to a local ABC News station, which broke the story of the accident this afternoon. The man, concerned that he could have been injured by the falling drone, contacted local police, who told him that no law had been broken and did not pursue the pilot. FAA rules state, however, that hobbyist drones must fly below 400 feet and keep away from airports and heavily populated areas like city streets. The Verge contacted FAA spokesman Les Dorr, but reached the following voicemail message: "I am out of the office due to a lapse in funding. Please call back after news reports advise a resumption of services for all federal agencies." Chris Anderson, founder of the drone company 3D Robotics and the online community for enthusiasts, DIY Drones, confirmed that this kind of flight was illegal. "The FAA has very clear guidelines on this, and such flying over built-up areas is clearly in violation of those rules (and has been for decades)," said Anderson. "One of the things we created DIY Drones for was to inform people about such regulations and principles of responsible flight. But clearly the message needs to get out better." The Verge has also reached out to the NYPD for comment. You bring an interesting point Darrell. The current US Government partial shutdown may slightly delay eventual ruling on the commercial use of this technology. 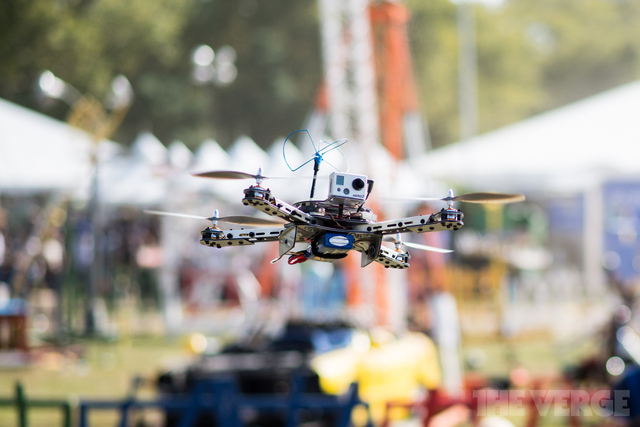 The FAA is mandated by our Congress to address and control the technology by 2015. Despite this flight is reckless and should not have been done with such (un)experience. I must admitt, these DJI drones can take some hits. My props would have been pulverized by the first of such impacts. As one can see there were no propsavers on that phantom. There were actually all kinds of infractions the Police could have pursued the pilot for. Public endangerment was clearly an issue here and it is illegal pretty much everywhere. However in NewYork they already have lots to keep them busy and if they enforced that they would probably spend all of their time arresting cabbies. I am calling for a universal warning checklist and or splash screen on all software used for the Rc hobby. It is not going to regulate anyone or place rules on anyone, but it will educate. The greater the availability of this technology at ever decreasing prices and greater ease of use means more people will buy and fly. If the number of fools or idiots is a constant in the population, then more fools or idiots wiil fly, proportional to the number of units sold. The only way fools will learn is for them to hurt someone, or almost hurt them, and they get sued or prosecuted for the injury. Advice to flyers of multicopters is like advice to anyone, fools don't heed it, wise don't need it. Is this 400' thing real law in the US or just urban myth? What is the true legal basis for the claim that people must operate remote control aircraft below 400 AGL? It's certainly derived from formal federal documentation (and, arguably, prudent judgment), but not technically a law. The FAA Advisory Circular linked above (AC 91-57, MODEL AIRCRAFT OPERATING STANDARDS), does explicitly state in section 3c., "Do not fly model aircraft higher than 400 feet above the surface." However, per the introductory section 1, "This advisory circular outlines, and encourages voluntary compliance with, safety standards for model aircraft operators." Therefore the word "must" in the original post is incorrect... "should" or "are encouraged to" would be more appropriate. That being said, flying inside a so-called "no fly zone" (like the one around DC) IS a violation and may result in criminal action. That's the thing we should take away from this. The rules and advisories necessary are already in place. And there could be a hundred more, and it still would not have any effect. Rules don't work unless people follow them. This is about understanding and respecting the technology, knowing it's limitations and applying common sense and respect for other people. A pilot that willfully disregards such concerns, should be punished. But an perhaps even bigger problem is the user who is made to think the quad is just a fun toy, either by marketing or just lack of knowledge. Flying over people in the middle of Manhattan. Sure why not, it's just a toy..
3DR, DJI et al, take a close look at the general aviation industry in the US and take heed! I don't have a phantom but from my experienc with these "toys", all of them come with some sort of "manual". And every single one of them that came through my hands (parkflyer, rc-helicopter, trainer-kits,....) stated one thing clearly that you should not fly over people. Is RTFM realy so hard? Is it so hard to use common sense? Every time i show up with a quadcopter or fpv equipment at my rc-club i sooner or later end up talking about one of these incidents and about reckless behaviour. Where i then have to explain people that there is a majority of us (multirotor and/or fpv pilots) that consider their actions and watch for safety. Because even if you take precautions theres allways something that can go wrong, no matter if its a rc-craft, a stove, a car or wahtever else. So lets all try to use our brains and be good examples.